Sew Mama Sew: Giveaway Day! Twice a year the amazing sewing blog, Sew Mama Sew, puts together an incredible Giveaway Day for bloggers and makers of all types. This December we thought we would get in on all the fun! 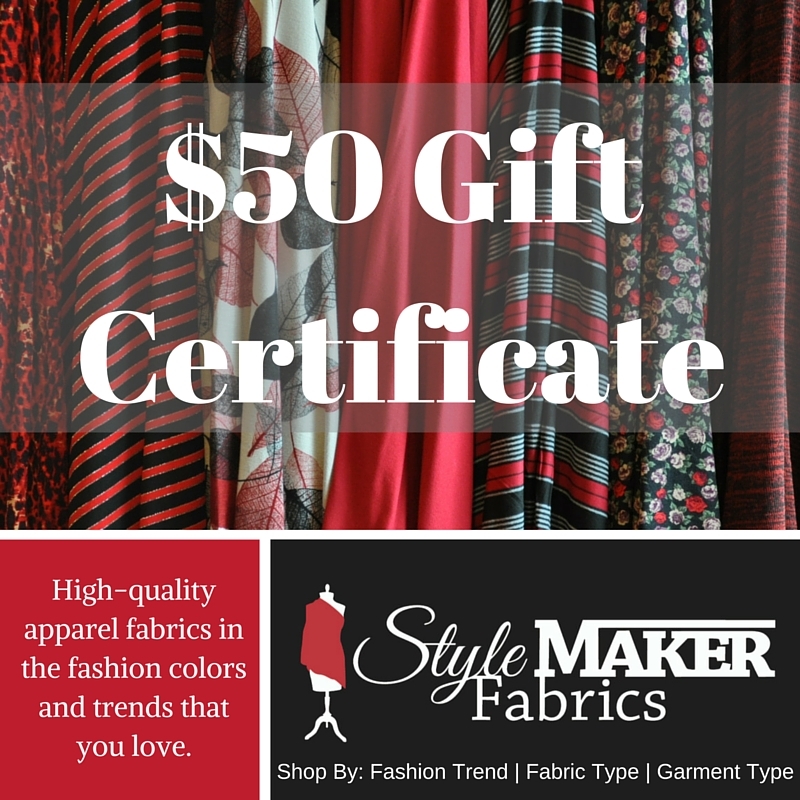 Simply tell us what you are making and gifting this holiday season in the comment section below for your chance to with a $50 gift certificate to our shop, Style Maker Fabrics. A winner will randomly be selected on the evening of Sunday, December 13th, 2015. Need some ideas for your holiday sewing or gifts? Be sure to check our our 12 Days of Sewing here on the blog. We are posting a new gift idea and some daily specials everyday. Check out all the post HERE. To all of the new visitors, we’d love to connect with you and stay in touch! 12/14/15: This Giveaway is now closed. Thank you to everyone who entered and congratulations to Bobbie, our randomly selected winner. Happy Holidays! Bobbie’s comment- the 5th comment posted. Note: The winner will be randomly selected from those who entered via comment on 12/13/15 and be notified via email. By entering this contest you are agreeing to sign up of our email newsletter. You may unsubscribe at any time. I made an angel wreath for my mom. I just made my husband a chambray buttondown for Christmas! I am making and giving a cell phone purse for someone who can’t keep up with her phone. I am making a sewing machine cover, bedside caddy, hanging baskets and coasters for presents! Thank you! I’m looking for something to make for my daughter. Glad to find another website for clothing fabric. I love to sew clothes. Amazing giveaway,so generous of you.I am making ornaments and hats,crochet and knitting. I’m making baby clothes and blankets for my soon-to-be-born niece or nephew! I am making a lot of pouches and fabric baskets. I made a zippy wallet for my husband and a pincushion for my daughter. Thanks for the giveaway. I made my Granny some slippers, my Aunt a stove towel, my sister and her family matching pajamas and my 10yr old and I are making her class bookmarks. The only quilty project I have been working on this year is a lap quilt for my sister. This year I am making tri-fold wallets for my co-workers! Thanks for the give away! I’m making pillowcases for my grandchildren and scarves for my daughters. Thanks! I’m making heating pads for my family! My 3 year old son asked for bow ties and neck ties! Who could say no?!? I’m making a stuffed toy for my baby, hopefully his stocking as well. And if I really find some good free time between naps, maybe a bag I meant to make for a friend last Christmas. Oops. I’m making matching PJs for my adult daughters! Thanks for the chance to win! I’m trying to finish up a couple quilts before Christmas. I have made a few tops for myself, a zippered tote bag and wristlet as a gift for a friend, and few infinity scarves to have to hand for any last minute gift I may need. I am making PJs for everyone! And Christmas outfits for my three kids. And maybe for myself, if I have the time. 🙂 I love sewing clothes and your fabrics would be perfect for my makings. Thank you so much for the chance to win! I have several tablerunners in the process. Just a few more steps to go. I am making a candy cane wreath. I saw is on FB and thought this would be simple, cute and different. I love shopping, especially when it comes to fabric. Thank you for being a part of the Sew Mama Sew Giveaway Day and giving all of us the chance to win that generous gift certificate. Happy Holidays to you. I need jackets for work. I made a small throw quilt for my mother in law, a wheelchair lap quilt for my aunt, and am making Farm Girl Vintage blocks into potholders for the family gathering gifts. I am quickly trying to finish up some pillow cases for the kids for Christmas, and bind a quilt for my daughter’s big girl bed. Having a blast doing it! We make all of our gifts…..so my list is long, and will not be complete! For everyone: the traditional Christmas morning jammies (Burda 7546 is our favorite!). Individual gifts I am sewing include men’s shirts, a faux fur vest, dresses, scarves, skirts, rompers and jumpers and a purse. Dolls for the kids, a wool shirt for my husband, and penguin pjs for my best friend. Just hoping it all gets done in time! i made and gifted three Sewing Workshop Pearl cardigans for my sisters. Hello, I am making crib sheets and burp cloths for some newborn twins. Thanks for the chance to win. I may give soaps this year. Thanks for a great giveaway! I’m making a bunch of stuff for a very crafty christmas – a quilt, a few shirts, a few ties, and various little car accessories 🙂 Yes, I have been and will be very busy but that’s the way I like it. I am making a wall hanging and a gym bag. I am so behind! I’m not going sewing crazy this December, but I made a stocking and an insulated trivet for my boyfriend. Thank you for the giveaway, I’m doing way more garment sewing than in past years! I made zipper pouches for the 9 grandkids. I’m making some Carolyn pajamas for my sister! Thanks for the chance to win! I made sets of 12 pot holders (one for each month) for my family members. I’m making a baby quilt for my new grandbaby! Also some purses for the girls. Currently trying to finish 2 christmas quilts for my daughters and a pillow with a paper pieced snowflake for my grandma. I’m making my aunt a pincushion with an attached thread scrap bag using vintage Winnie the Pooh material. I’m making bags for gifts. I’m making my sister a quilt…shhhhhhhshhhh it has only taken me five years to finish it!!!!! I am making and giving 5 dear elder ladies at my church lap quilts. They have prayer meeting every morning and include me and my family in their prayers every day so the least I can do is help keep them warm! That church is cold in the mornings! I also am making dresses for my grand daughters American Girl dolls and pillow cases for each grand child (6!) and a crib quilt for the 6 month old new one! I think I can make it! I’m making cross-stitched ornaments for my whole family, which is some undertaking! HELLO, I made for my first time Table Toppers of Christmas fabrics using the 60 degree ruler! They are so neat to make! Loved the design of these when finished and they were not that difficult to do. MERRY CHRISTMAS TO YOU! I made my sister a drapey cardigan and am making my daughter dragon wings! It’s pajama time! Matching pajamas for the whole family. Plus pillowcases for the nephews, and a scarf for my mother-in-law. Love sewing this time of year! I’m making quite a few zippered pouches and quite a few covered books (which I use all sorts of fabrics – cottons, silks, linen – sky is the limit). I’ve made a bunch of zipped bags as gifts! I’m making quilted Tea Pot Cozies and matching Cup Cozies!! I’ve made dolls for my granddaughter and great niece. Animals for my grandsons and fur scarfs for a number of people. I love sewing presents for Christmas! I’m making a few bags for gifting, and clothes for myself. I have nothing to wear! I’m working on some totes and pillows to donate to a senior citizen’s center for the holidays. I am making origami bags and fabric bins! I’m making skirts for two of my nieces and a blouse for another. Thanks for the chance! I am making an apron for my son with lots of pockets and a knitting roll up bag for my daughter to keep her knitting needles in. I am not sewing a lot this holiday season — just an apron for a friend. I’m also working on an opal ring for my sister. Some christmas stockings and 2 mini quilts. I made a table runner and placemats for my mom. I have two baby quilts I need to make. Thanks for the giveaway. I’ve been making all kinds of things – my fave so far has been a lunch box for one of my sisters. I’m working on coordinating dresses for my 4 daughters… and I also have to figure out something for my young brother-in-law! I made a Dr Seuss quilt for my 18mo old granddaughter ! I made some baskets and small quilty projects for giving this year. I’m sewing some pj’s for the little ones. So easy and cute! I gifted some new baby clothes… would love to win fabric to make another set! Knitting gloves for my mom! I’m hoping to finish three jean picnic blankets by Christmas. I am making faux fur vest for my daughter in law and my niece, a pair of pants for my 99 year old grandmother, a flannel scarf for another niece and if time permits a faux fur jacket for myself. I’m made lunch bags for all my sisters /sisters in law. Star wars quilts for my 2 boys, kitty quilt for my girl, and a bicycle quilt for my husband. Been busy! I’m not making anything right now, but I hope to be making some pillowcases soon! Thanks and God bless! I am gifting lots of quilts and magic pillowcases this year. Quite frankly, its been exhausting. I just finished making cascade sweaters for my granddaughters. A Dog quilt for my grandson. Many thanks for this generous giveaway. I ‘m finishing my husband’s Jedidiah trousers for his x-mas present. Happy holidays! I just finished a quilt for a friend. I haven’t had time to make anything this year. Its the first time in many years I have not made anything to give as a present. I have a quilt almost finished. i am making scarves as gifts and some baby clothing items as gifts too! I’ve been making table runners, mug rugs and pie carriers. Thanks for the giveaway! Mugs rugs for every occasion! I’m trying to finish up a table runner for my parents. They still have the black and orange pumpkin one I made them up! I love the great fabrics in the shop. I’d like to get some more experience making clothes this coming year! I am making cosmetic bags for the granddaughters. I have i purse and 2 wallets finished and one more purse to go for my other friends. A quilt for my parents. Thanks! Ive been making pillows this year! I am making Christmas pjs for my 2 girls, niece and nephew. I plan on doing some sewing for my baby due in Jan. Other than that I will be making cookies. Oh so many things! I am making a quilted tree skirt, a Dr. Who tote bag, a wind sock with matching garden flag, a cathedral windows pillow and hopefully something for my son! I have made a nail polish mini quilt! Sadly, I’m not making anything this season. We’ve been trying to sell our house so all crafty goodness has been packed away. Hope to get back to it soon! I am currently making a Christmas table runner for a friend. I chose the Drunkard’s Path template and it’s turning out very nicely! It’s tedious work, but worth it! I’ve been sewing clothes for my tall, skinny preschooler so she can have warm ankles and clothes that aren’t falling off AT THE SAME TIME! I’m making a car blanket for a friend. I also hope to make some cloth napkins for friends and a lap quilt for my brother-in-law who just had a major stroke and is paralyzed on one side. Perhaps some fabric gift bags to donate if I can find enough time. I’m giving out some knits this year — three hats and three pairs of mitts! I have made 2 table runners – have 2 more to go and I need to finish a t-shirt quilt for my granddaughter. I need to get sewing! Great giveaway – thanks for the chance. I just mailed out a baby Christmas quilt for my niece. I am working on quilts for the grandkids! I am making lap quilts and mermaid tail blankets. I made pillows this year! I am making pot holders, Christmas stocking and a wall hanging for Christmas gifts this year. I am making some snowmen mug rugs. I made a quilt for my son and another for a very dear friend. I am sewing tons of things; at the moment working on doll clothes. Not really making any gifts this season but would love to learn how to make an infinity scarf for future gifts. Started grad school this fall, so really light on the homemade presents this year. However, I do have a paper sculpture project and two custom hoodies on the list! I’m making Riley Blake’s “Paper” Dolls for my granddaughters and pajamas for my grandson. I also have a quilt top I’d like to make a dent on. A quilt for hubby out of his old pants… but running out of time…. running out of pants! I’m making Christmas banners this year! I made Market bags for my grandsons teachers. I’m making a wool cycling jacket for my honey, plus some small patchwork gifts for others. I made a quilt and two sofa pillows. I am beading ornaments for my son’s new girlfriend. I’m making napkins for gifts & doll clothes for granddaughter ?? I’m sewing a quilt for my nephew and a fabric crown for my niece and knitting a scarf for my mother and a cowl for my sister in law. PJs,lots of PJs to open Christmas Eve. Thanks. I have been making pillows this year as well as new jammies for my kiddos! I am working on fabric i phone stands. Thank you for the giveaway. I made rice heating backs with lavender essential oils and quilts for all my loved ones! I have been making t-shirts. Awesome giveaway! This December I’m making a velvet shrug for a Chritmas party, Flannel pajamas for the little guy, two Jasper hoodies, and my first pair of jeans with the Liana Jeans sew along. I am making quilts. new follower on e-mail, instagram and facebook. crystalbluern at tds dot net. I’m hoping to make a stocking for my three month old. Making a quilt with marvel fabrics for my nephew! I’m making wall hangings for all my sisters. I’m making a solar system quilt for my sons. I’ve finished up two quilts for Christmas gifts this year. I have been working on some tote bags as gifts. I am making Noodlehead divided baskets. I’m making some triple zip pouches for a few friends. I just tested a pj pattern for me and will be testing a hoodie pattern on both my daughter and myself. I have made hexagon trivets and open wide pouches so far. I need to finish a table runner for my sister still. I am making placemats and a table runner for a friend. Thanks for the great giveaway. I’m making a mini, thanks for the giveaway! I’m making some pj’s, and a cool wall hanging for my sister ! If all goes well, I’ll be making a few jumpers, shirts, and a bed tent! I’m hoping to make some embroidered felt ornaments. I’m making scarves for some female friends! I am making tennis skirt and bracelet for my niece. I just finished a quilt for my dad and am working on finishing one for my mom before Christmas. Thanks for the chance to win! I’ve been making my girls some clothing, and a couple of quick gifts like coffee sleeves and appliqued shirts! I’m making a quilt for my mom! Unfortunately, I’m not making anything this holiday season! I’ve been so busy with my daughter’s wedding that no one will get homemade gifts this year from me. But there’s always next year!